UNC System President Margaret Spellings will lead a new commission of influential business and political leaders that aims to shape North Carolina policy on K-12 and higher education, The News & Observer reports. Spellings announced the My Future N.C. commission this week, tapping a slate of nominees with connections to Gov. Roy Cooper and Republicans in the N.C. General Assembly, and elected officials such as Republican Superintendent of Public Instruction Mark Johnson. The roster also includes longtime conservative education reformer and booster Art Pope. 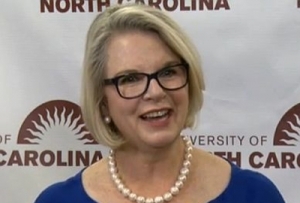 The effort is led by UNC President Margaret Spellings, who will co-chair a group of 30 leaders along with Dale Jenkins, chief executive officer of Medical Mutual Holdings, and Andrea Smith, chief administrative officer of Bank of America. Spellings said it became clear to her that North Carolina needed a “shared vision” for getting more people better education, from pre-K to high school and beyond. National education players, from the Bill and Melinda Gates Foundation and the Lumina Foundation, had told the UNC Board of Governors that North Carolina was among a few states that had no common agreement on educational attainment, which is generally defined as the highest degree an individual has completed. In 2015, 29.4 percent of North Carolinians 25 and older held a four-year college degree, and 86.6 percent had a high school diploma. Both measures have risen steadily in the past two decades, though North Carolina is behind the U.S. average. Economic mobility – the chance that a poor child will rise to the middle class – is lower in North Carolina than in many other states, and the state’s per capita income is 34th in the country, according to U.S. data from 2010-14. Previously, different sectors have had their own achievement goals, but there has been no overarching plan adopted by all the players. The first step is to arrive at the goal, she said. The second is to craft specific strategies for getting there. Spellings envisions more clear pathways between community colleges and universities, better transitions between K-12 and community colleges or universities, better ways to help high school students understand college options and financial aid. She said higher education has to make sure it is doing all it can to train teachers and provide research to help the state reach third-grade reading goals. One item that Spellings has been keen on is having a standardized credit acceptance policy at colleges for Advanced Placement courses taken by high school students. She said the state has invested a lot in AP and then students don’t end up getting credit based on individual college policies. Part of the strategy is getting stakeholders on board and invested in the process, Spellings said. The commission includes some heavy hitters in North Carolina business, education and philanthropy, including representatives from Republican leadership in the state House and Senate and Gov. Roy Cooper, a Democrat. The commission will begin its work next month and continue for the next year to 18 months, producing two reports. One will recommend goals for educational attainment and outline obstacles that could stand in the way of those goals. The other report will put forth specific policy recommendations to achieve the goals. Liz Chen, co-founder, MyHealthEd Inc.
Oscar Wong, founder, Highland Brewing Co.